A baby's smile gives mom a cocaine like high. Dr. Lane Strathearn thinks that a form of "smile addiction" may be critical for the formation of a healthy mom-child bond. Dr. Lane Strathearn, an Associate Professor of Pediatrics at Texas Children's Hospital in Houston, says that mothers may well become "addicted" to the smiles of a happy baby. 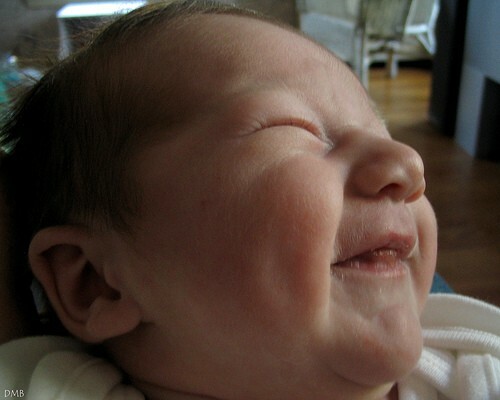 He ran a study that examined what happened in three areas of the brain very associated with cognition, emotion and reward/pleasure (the substantia nigra, the striatum and the frontal lobe) after new mothers were shown pictures of smiling infants. What he found was that these pictures stimulated an intense reward reaction in these three regions of the brain, a reward reaction very similar to that of a cocaine or methamphetamine high. These reward regions were also activated by pictures of beautiful or sexual scenes, but a smiling infant was far more stimulating to the new mothers. Dr. Strathearn says that this reward experience may in fact be addictive, and may influence parenting behaviors and the mother-child bond. Since certain drugs like cocaine and meth amphetamine are so often associated with maternal neglect, these drugs may in some way be supplanting this natural addiction to a child's happiness, with something more artificially produced. He explains, "Cocaine, which activated dopamine receptors, seemed to compete with natural infant-related reward signals which may relate to relatively high rates of child neglect in cocaine-exposed mothers. Neglect and abuse can result, with devastating effects on a child's development." Interestingly, although mothers reacted far more strongly to pictures of their own baby smiling than to pictures of other children, a picture of any crying baby evoked a very similar response, with no real difference between a mother's child, and an unknown infant.